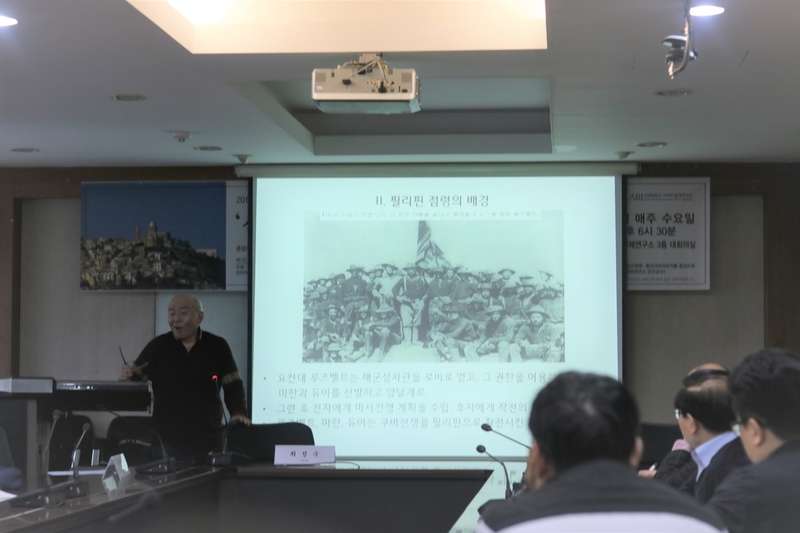 Since April 3, the Korea University (KU) Asiatic Research Center have initiated a weekly seminar on colonization. On April 10, the Asiatic Research Center held their second class of the month, discussing the United States’ colonization of the Philippines and the Insula Cases. In this lecture, Choi Jeong-Soo (Seoul National University of Education) participated as the main lecturer. Choi started the lecture with an explanation on Spanish—American War that occurred in 1898. The war ended with the United States’ victory, allowing them to take over several colonized countries that Spain used to dominate. Then he explained how this incident triggered endless debates on whether it is right for United States to recolonize what was under Spain’s control. He mentioned two contrasting arguments on the colonization of the Philippines; some agreed with United States’ colonization of the Philippines while others asserted that the country should abide by founding principles and reject colonalism. Though the historical topics are comparatively profound and complicated to understand fully, it definitely provides audiences with meaningful information that are difficult to learn on one’s own. He also aimed to criticize past histories of colonization in several countries including Korea, stating that there are still more issues that needs to be discussed on for the society to differentiate right from wrong. Subsequent lectures are each held on April 17 and 24.